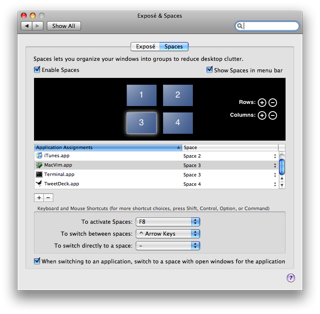 Given I'm also a desktop FreeBSD user, one of the features I was desperately anxious to use with Mac OS X Leopard was the "Spaces" tool. As with virtual desktops on Unix-like workstations, when you enable Spaces you get access to a slew of virtual desktops which gives you much more screen real estate on the same display which is especially useful for laptops. Suffice to say, I cannot live without it! As is typical with Apple software though, when they implemented this common feature (well, common on everything except Windows!) they included a few other useful features that set it apart from the competition. What's curious though is that Spaces isn't enabled at all by default on new Leopard installations, and I know several recent converts who didn't even know it existed. Perhaps Apple assume this feature is for more advanced users, which is a shame because I think it actually makes multitasking computers much easier to use. To enable spaces you want to open System Preferences on the Apple menu, click the Expose & Spaces icon under Personal, click the Spaces tab and check Enable Spaces. Once you've done this, a spaces icon will appear on your menubar and you're ready to go. While the menubar icon is a useful way to change desktops, it is much clumsier than using dedicated keyboard shortcuts, so the first thing I always do is change the To Switch Between Spaces list box option to ^ Arrow Keys so you can cycle through them by just pressing [Ctrl] and [→/←] for example. The above commands are the ones most people use, and are similar to what is available with the virtual desktops on Unix-like workstations. What makes Apple's implementation infinitely sweeter though is the ability to assign applications you generally have open all the time to their own "space" by default. This means when you open your commonly used application such as iTunes or a Twitter client for example, it will automatically open in the space you assigned it, NOT the space you're currently working in. I find this much easier and smoother than having one desktop and constantly minimising or hiding windows only to bring them back. For example, I have my virtual desktops, sorry "spaces", configured so iTunes is always open on space 2, TweetDeck is always open on space 4, and my stacks of Terminal windows are on Space 3. This means I can have my web browser and Finder windows open on the primary Space 1 which is where much of my work gets done. It's a fantastic way to multitask; I can't imagine going back to an OS that has you minimise every window you still want access to but not right at that moment! It's also a great way to compartmentalise what you do, so you know music related stuff is in one place, Twitter is in another, and so on. There's no more fumbing around thousands of open windows at once. Once you get the hang of using applications in their own space it becomes second nature, yet I know of very few people who use it at all. 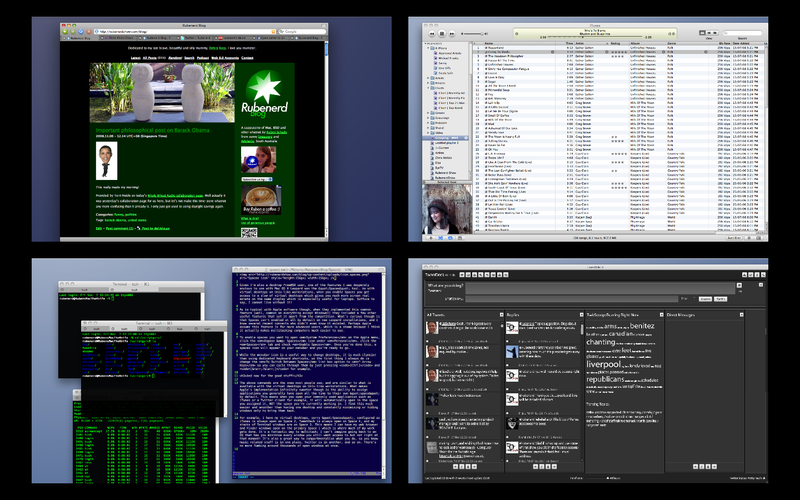 If you have Leopard I really encourage you to try using it; it is a HUGE step up from minimising or hiding windows. If you're unfamiliar, don't feel as though you don't have to start with trillions of virtual desktops, heck even just having two makes live so much easier. You can always add more once you become more comfortable using them. Now if you would exuse me, I'm off to hit [Ctrl] [→] to change the currently playing song. 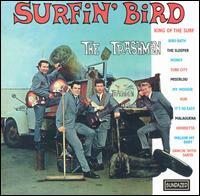 I've had the Trashmen playing the same three minute song 28 times now and it's getting somewhat repetitive. The bird is the word. The bird bird bird. The bird is the word. Don't you know about the bird? Everybody knows that the bird is the word!